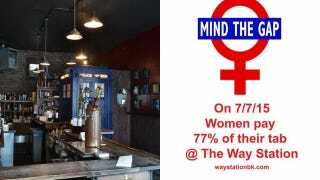 One bar in Brooklyn is doing their part to protest the wage gap—charging ladies 77 percent of their bar tab. Because the gender pay gap is “some shameful sh-t,” the bar wrote in an email promo for the upcoming July 7 theme night. “Let’s level the playing field, even if it is just for one night. Women deserve better. Recognizing this discrepancy is just a start,” the message read. If all companies leveled the playing field by charging us broads 77 percent of stuff, men would probably line up to protest the wage gap. ‘Merica. Image via The Way Station Twitter.